A beautiful showhome with a West End of Aberdeen look in the heart of the countryside is available. The inspiration for the four-bedroom showhome came from the Great Western Road family home of housebuilders, Drumrossie Homes. The last available home at the Denwell Park development in Insch is available for £345,000 with luxury fittings included. Aimee Smith, sales and marketing manager at Drumrossie, said: “The design was inspired by the family home in Aberdeen’s Great Western Road – a street with so many attractive townhouses. The whole Denwell development is a blend of contemporary and traditional. By offering a taste of the city in the countryside, buyers can have the best of both. The Arran Townhouse has a balcony that is accessed from the large kitchen dining area, which boasts impressive glass sliding doors spanning the width of the property and enjoys wonderful elevated views of the surrounding countryside. There is also a lounge, vestibule and WC at this level. The lower ground level comprises a double bedroom/office, family room, shower room and utility room. There is direct access to the garden through French doors. This level of the property is ideally suited to be used as a guest suite or ‘granny flat’. The ground floor and the lower-ground floor have underfloor heating. The top level of the home features the master-bedroom which is complete with en-suite shower room and a large bay window overlooking green open space to the front of the property. There are a further two double bedrooms and a spacious family bathroom. The showhome has cupboard space throughout the three levels. The high specification of the property is apparent throughout with quality fixtures and fittings including partial glazed doors and chrome heated towel rails. Other features include high ceilings, fyfestone external finishing and a quality Hacker kitchen provided by Laings of Inverurie. The showhome has a single garage with additional private parking at the rear of the property. Showhome furniture could be sold by separate negotiation. Insch, which has a train station, is 27 miles from Aberdeen and 12 miles from Inverurie. 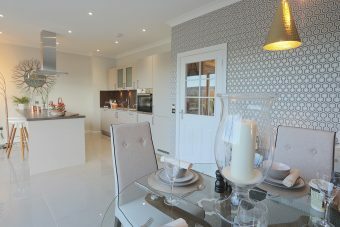 For further information on the Denwell Park showhome, email info@drumrossie-property.com or visit www.drumrossie-property.com.